Compact chrome triple train horn with three tuned metal trumpets. 14.25″, 11.5″, and 9.25″, also available in black XCR2.0 Stealth finish (P/N HK3-1). This horn produces a startling blended three-tone blast that is guaranteed to get attention. 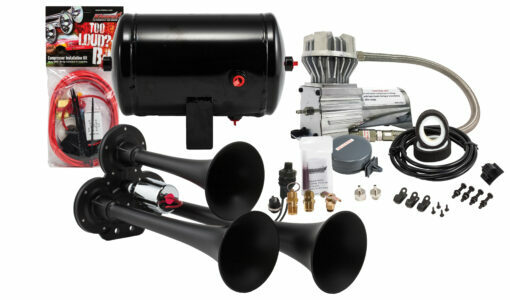 The package includes a 130 PSI air compressor and 1 gallon tank for more blast time.